With the first night out of the way, night two and night three had been positioned as extra rounds versus going out to eat with $70 budget. The second night’s cooking had focused on seafood from Petty’s Meat Market. This was the scope of new items for night two. After unwrapping, I had applied thin coat of olive oil, salt and garlic powder on the skinless side. This may have seen simplistic and repetitive, but why over-complicate good product. With medium-high heat on, I had cooked skin side down for 7 minutes. Here was the start of the frying before sealing with a glass cover for moisture. With the last 3 minutes (10 min. total cooking time), I had flipped the fillet to cook the skinless side until blackened. The end product was the below. 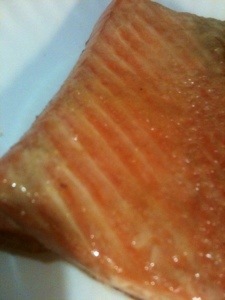 The Salmon was moist and lightly seasoned. 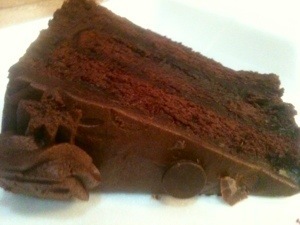 At first, I had been looking forward to this dessert; however, it had been too dense and sweet to finish in one sitting. Back to the frig in favor of something different and lighter, perhaps a Zombie baby? 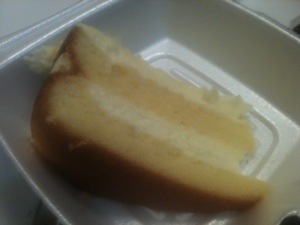 This cake was light with slight lemon citrus filling and frosting. It was better compliment to the main entree. No Zombie baby needed here! No portion had been seen since this evening. This entry was posted in Central Florida, Food and tagged Budget Dinner, Godiva Chocolate Cake, lemon mascarpone, Longwood Florida, Petty's Meat Market, Salmon. Bookmark the permalink.